"Free Speech, Free Press, Free Society." To order a yearbook on line for the 2018-19 school year, please go to ybpay.lifetouch.com and enter code 2116219. All orders must be recieved by April 5th. Cost is $20 and hardcover upgrade is $25. For the third year in a row, Niles Middle School opened its door to the district’s fifth grade students, welcoming them to experience what school will be like next year when they move to the middle school. The fifth grade transition program serves as a pre-orientation for students. 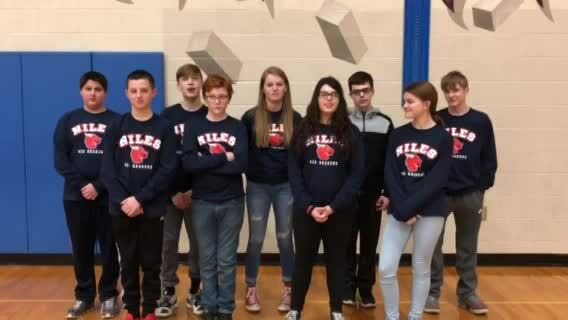 The middle school’s Principal Sam Reigle, Assistant Principal Allyson Martin, Dean of Students Brian McConnell, other staff members and the middle school’s WEB students hosted the program, which aims to familiarize students with Niles Middle School and the sixth grade. In particular, the fifth grade transition program allows students to tour the school, it also provides them with a better understanding of the school’s schedule, course schedule, sports, clubs, academic programs and extracurricular activities. In mid August, the middle school will host its WEB Orientation Program and students will return to the middle school to prepare for the next step in their academic journey. Congratuations and Thank you Max Ries for representing NMS at the county Spelling Bee 2 years in a row finishing each year in the top 5. Congratualtions and Good Luck to our 6th Grade Prep Bowl Team! Congratulations to following MS Students that were nominated and selected to represent Niles Middle School in this years Honors Band. Follow us on Instagram @nmsreddragons!